On your first visit to the practice, you will initially be required to fill out a full medical history questionnaire and smile evaluation form. Once this has been completed, the dentist will meet you to carry out your full oral health assessment, including any X-rays where necessary. Based on the outcome of the assessment, a discussion of your oral health will take place followed by an explanation of any treatment required together with the associated costs of this treatment. You also have the opportunity to discuss any queries or concerns that you may have in regards to your own oral health and the proposed treatment plan. do you charge if I miss or cancel an appointment? At our practice we will endeavour to manage our appointments system to avoid delays in appointment times, and minimise the loss of surgery time through cancellations and failed appointments. Appointments cancelled within 24 hours may be liable to charges. Please visit our: Failed Appointments Policy page for more information. how often do I need a check-up? 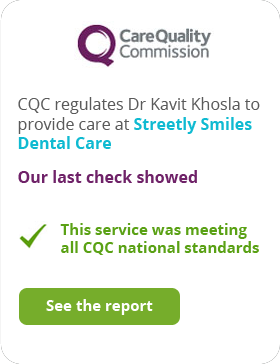 The usual recommended time between check-ups (oral health assessments) is 6 months. However, once the dentist has assessed you and depending on the state of your oral health and any previous history of dental treatment, we may recommend that you attend more regularly, such as every 3 months, or less frequently at every 12 months. I’m scared of the dentist. How can you help me? We try to adopt a very caring and empathetic approach to our care, as it is very natural for patients to be apprehensive when visiting the dentist. Once you are comfortable with the dentist and the surroundings we try to keep patients in control of their care and will never proceed with any treatment, unless you are happy. do you have parking near the practice? We have free parking on our driveway in front of the practice which is on a first come first served basis. There is also free on-street parking available outside the practice or on neighbouring residential streets. can I spread the cost of my dental treatment? To make the cost of your dental care more affordable, we offer a range of membership plans that allow you to spread the cost of your routine care. For higher priced treatment plans we may ask that an initial deposit is taken before treatment is commenced. We also offer interest free finance packages of up to 12 months for treatment plans over £450. Please visit our Membership Plan and Fees pages for more information. Please visit our Complaints Procedure page for information on this. what do I do if I have a dental emergency out of hours? During our normal working hours, you can call the practice from 8.30am and we will endeavour to provide emergency appointments on the same day, but ensure that you are seen within 24 hours of contacting the practice. If you are part of one of our Membership Plans, we do not charge a fee for the visit, only if any treatment is carried out. If you are not a registered member of the practice, there will be a charge of £45.00 (exclusive of treatment costs).